Cafe 5: Taste Ribfest at Home Thanks to BBQ Supply Co. In this segment of "Dishing With Chicago Chefs," champion pitmaster Dylan Lipe of BBQ Supply Co. previews this year's Ribfest and shares a special recipe, which he'll be serving up at the foodie fest this weekend. 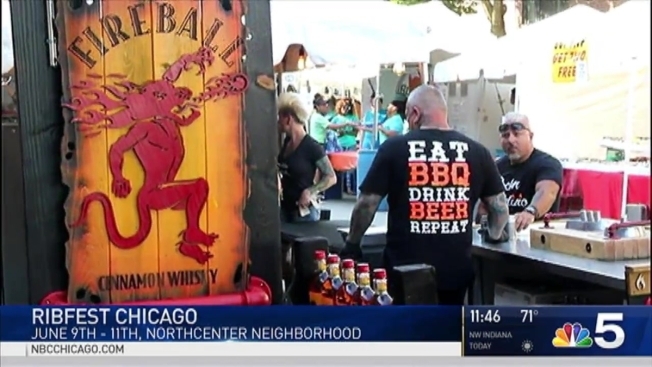 The 19th annual Ribfest Chicago, known as the city's largest cookout, takes place June 9-11 in Chicago's North Center neighborhood. Admission is a suggested donation of $10 per person or $20 per family. VIP passes are also available here. Source a good rib from your butcher - specify the style of rib and weight (I like 2 1/4 downs). Dry Rub your ribs at least 4 hours prior to cooking, but don’t leave the rub on for longer than 24 hours. Get your smoker warmed up to 225 degrees. Smoke ribs, fat side up, for about 5 hours - start ‘em low ‘n slow at around 225 degrees, ramping up to about to 250 degrees for the last 2 hours. Ribs like fruit woods like Cherry or Apple for color and a heavier wood like oak or hickory for BBQ Smoke Flavor. Ribs are done when they turn dark in color, and tear without a lot of effort. SMOKED RIBS SHOULD NOT FALL OFF THE BONE! Serve with sauce on the side..ENJOY!